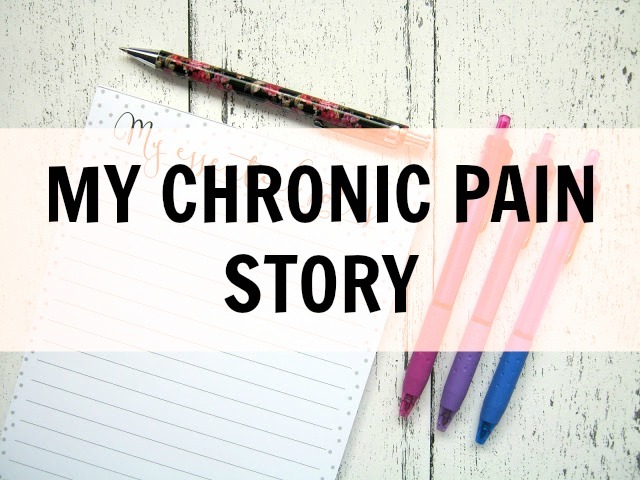 Back in July Georgina from She Might Be Loved wrote a post titled 'My Chronic Pain Journey', a an open insight into her experience with chronic pain. It was an incredible post and I can imagine how much emotional and physical energy it took to write it, since I suffer with chronic pain too. Her post made me realise that actually I've not really talked about my chronic pain on here in too much detail. 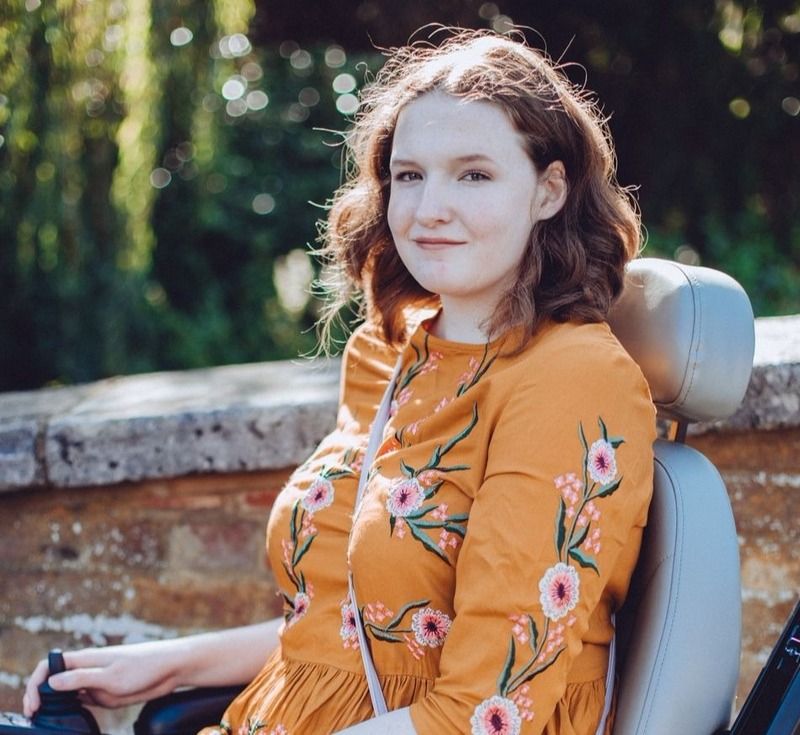 I think most of you know that pain is my main reason for needing a powerchair to get around but I've never talked about my experience and story in depth on here since my last surgery. I've adapted to living in pain all the time, it's so normal to me now, it's just a part of me. It occurred to me that writing about my story would probably help others though, as I've tried most treatments and most medications by this point. But I also think this might help me, whilst I've adapted to this life I still have plenty of bad days where I constantly ask myself 'why me?'. I think every chronic pain sufferer has to battle that question on a regular basis. So, here goes! Nothing held back, this is my experience of living with chronic pain. A little bit of context to begin with. I have a genetic connective tissue disorder called Marfan Syndrome, it can affect just about every part of your body including your eyes, heart and skeleton. I've known I've had it all my life so I've grown up with this condition. As a child I suffered with hypermobile joints that would bend more than normal and as a result I often suffered joint pain, it wasn't a fun experience but it was totally bearable. I still climbed trees outside my house and kept up with my brother as we cycled to the park. It was when I was a teenager that my health started to go downhill. I was diagnosed with a condition called Scoliosis in my early teens, it's the sideways curvature of the spine and is a common problem in teenage girls. It's a condition that I developed because of Marfan, known as a secondary condition, and because of this it progressed quickly and severely. 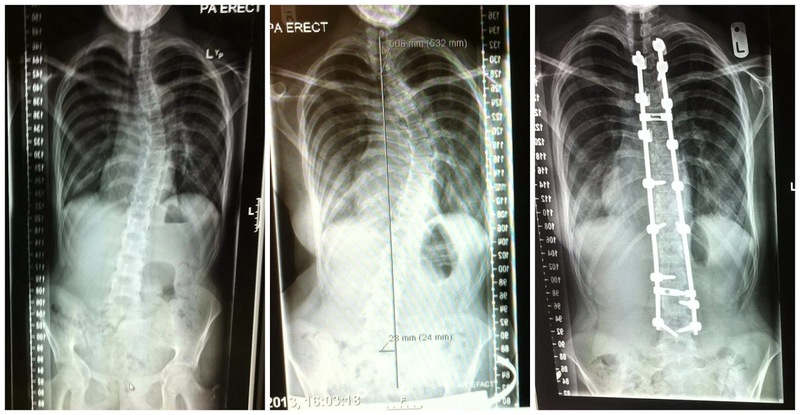 Within a couple of years of my first x-ray my curve had deteriorated to the point where I was having to take weeks off of school at a time due to back pain and even when I could attend I couldn't get to half my classes because they were up 2 or 3 flights of stairs. This was my first experience of severe pain, not annoying pain but 'I can't get out of bed' kind of pain. I was booked in to have my spine operated on, they would use metal rods and screws to manually straighten my spine into a straighter position. I was told this would probably get rid of my pain, or significantly help it, so whilst the pain I was experiencing was bad, as far as I was aware it was going to be temporary. Oh how wrong we all were. I suffered complications in the months after the surgery, a screw had been placed on a nerve meaning that I was experiencing excruciating pain down my right leg every time I sat up or stood. For the first few months after the surgery I could barely sit up long enough to eat a meal. Again though, everyone kept telling me that it would improve, it would be temporary. Eventually I had to go into the operating theatre again to have the screw removed and replaced as the pain wasn't disappearing. The surgery worked, it was a success and within a couple of months the pain in my leg started to improve. It would soon be replaced with a new pain though. Fast forward a little while and I find myself in hospital again, having a hip replacement at the age of 18. More promises that the pain I was experiencing would be cured, it would be temporary. And they were right, the hip replacement was and still is my most successful surgery to date. My other hip needs replacing too and I'm hopeful that it will be just as successful when the time comes. During all this time though I was experiencing increasingly severe back pain. We had no idea what was going on, my spinal surgery was meant to correct this pain and yet it seemed to be coming back and it was far more severe than it was pre-surgery. I found myself having CT and MRI scans every 6 months because they just couldn't pinpoint the problem. At this point I was losing more and more of my independence and mobility as time went by. 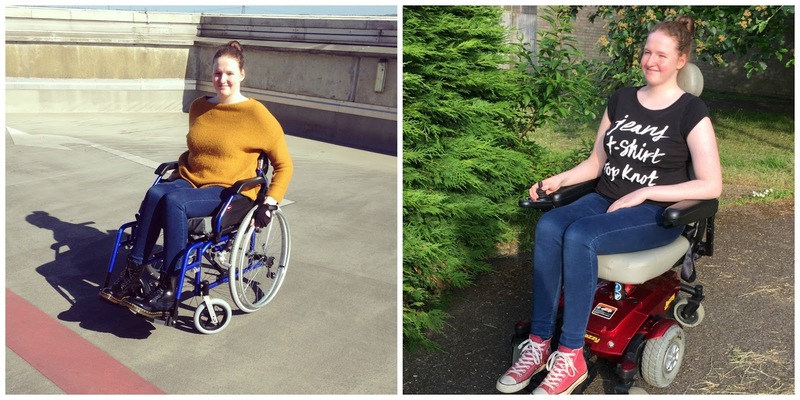 At first I needed a wheelchair for long distances, days out and supermarket trips but soon using a wheelchair become part of my daily life. My spinal surgeon didn't seem to care though, nothing was coming up on the scans so he simply didn't believe me. By this point I'd had to leave school, I wasn't able to work and I felt like I wasn't even living, I was just surviving. It was so frustrating not being believed by my surgeon, he simply didn't seem to care about my quality of life. At this point I was seeing more doctors than I could count and trying everything I could to quiet the pain. I started off with codeine, which quickly became ineffective and also gave me severe headaches. Then tramadol, which worked at first but ended up making me very ill. After that I had to fight hard to get stronger pain relief, eventually I was put on oramorph (oral morphine) and I stayed on that for about 2 years, for the first year it was pretty effective but the effects soon wore off as my body adjusted to it. Then I tried out patches, both fentanyl and buprenorphine but I reacted to them both quite severely so was quickly taken off them. During this time I was also trying different nerve pain medications, amitriptyline, nortriptyline and gabapentin, all of which did nothing for me. I was more than frustrated at this point, I was angry, furious that my body was doing this to me and furious that none of the medications were working. It felt like one thing after another. I saw rheumatologists, several different ones at several different hospitals but none of them could come up with any meaningful or effective treatments. I even tried acupuncture, which I was lucky to be offered on the NHS but none of it helped. During this time my spinal surgeon was still disbelieving, still convinced that the pain would be temporary, even though I was having to use a powerchair to get around by this point. It wasn't until June 2016 that I finally got an answer to what might be causing my problems, a large spinal cyst called a Tarlov Cyst was making itself comfy in my sacrum (a triangle shaped bone at the bottom of your spine). It was measured to be around 5cm by 6cm and it was, and still is, eroding my sacrum. We found out that this type of cyst is commonly found in those with Marfan Syndrome but we also found out that many doctors believe that they don't cause any symptoms, my spinal surgeon included. Even now he still isn't convinced that it is the cause of my pain and nerve symptoms but at the same time he isn't investigating other reasons or offering alternatives. He is just ignoring the problem. I recently had a specialised CT scan called a SPECT CT scan and a bone scan to try and investigate the cyst further and I'm due to get the results of them at an appointment in September with a neurosurgeon, the only person in the UK who might be able to operate on my spine. I'm trying to stay hopeful but it really has been one thing after another for around 4 years so it's tough not letting my mind wander to negative places. My bad days are when I let myself think of everything I've missed out on over the years. I'm not able to work, I left school with just my GCSEs and a lot of potential that I can't use, I've missed out on enjoying big birthdays like my 16th and 18th. But I've also missed out on the small things. I don't have friends that I can meet up with for coffee and a chat, my social life being replaced with hospital appointments. I can't sit up long enough to even comfortably watch a movie in a cinema and I can't be as spontaneous as I'd like. It's all those small things that I miss out on, that my chronic pain forces me to miss out on and sometimes it all gets a bit much. Sometimes I just want to curl up in a ball and not come out of bed for days. Chronic pain is undoubtedly some of the reason why I suffer with depression and anxiety and working through that in CBT (Cognitive Behavioural Therapy) helped me a lot but, it hasn't removed my need to be on anti-depressants. For years my old GP told me I was too young whenever I tried to discuss them with her (on every occasion I was over 16), I'd seen a handful of counsellors by that point with no luck so I felt like it was the right time to try medication but she was always against the idea. When I moved up North and got a new GP they were really open to me giving them a go once I'd explained my history and what I'd already tried, they were even surprised that I wasn't already on them. I've been taking them for a few months now and I think they've made a huge difference, my bad days aren't quite as bad as they used to be now and I find my everyday anxieties easier to manage. Through all of this I definitely learnt that treating chronic pain has to be a multi-disciplinary effort, no one doctor can solve all your problems or offer all the treatments you need. As I'm writing this post I'm currently on Pregablim, Arcoxia and Sublingual Buprenorphine for my pain, the most effective cocktail I've tried so far. It makes day to day life that little bit more comfortable but my pain is so reactive to sitting upright that it's unlikely that I'll ever find a medication that is truly effective. There isn't a miracle treatment and I'm pinning all my hopes on this one surgeon. Perhaps not the best thing to do, I might be setting myself up for disappointment, but I have to have something good to focus on. I have to have hope that things will improve, that next year will be better than the last. If you want me to talk more about my chronic pain experience then do let me know and I'll talk about it a little more on my blog! Thank you for sharing your chronic pain journey with us. As a chronic pain sufferers too I really feel for you and the lack of support from your doctors.